This part of California is located along US 395 in the south eastern part of the state. Los Angeles is about 200 miles from Lone Pine and San Diego is about 330 miles. Driving time from Los Angeles is between 3 and 4 hours depending on how fast you like to drive. Driving time from the San Jose Bay Area to Lone Pine is about 7 to 8 hours depending on the season. San Francisco is about 400 miles from Lone Pine during the summer months and about 440 miles during the winter. This is because Highway 120 is closed over Tioga Pass during the winter months and you have to take the great Interstate 80 to Reno before heading down US 395. Tioga Pass is a well-maintained road during the summer months. It is a bit narrow in places but is a surprisingly decent road for being at such a high elevation. However, watch those brakes coming down the eastern part of Tioga pass. This part of the road drops quite quickly compared to the climb from the western part of the Sierras. Interstate 395 is a great road and you can make some good time on it. It is a divided road in places with two lanes per side. If you are driving from the Los Angeles basin, note that the 395 hits the 15 just north of San Bernardino. If you are driving from Paso Robles in the north, and Santa Barbara in the south you most likely will pass through Bakersfield. Highway 178 cuts over from Bakersfield through the Kern River Canyon, past Lake Isabella and over Walker pass before coming out on Highway 14 just a few miles south of Interstate 395. (Highway 14 is a good route into the northern Los Angeles area) Highway 178 is a very good road except for the narrow curved portions just outside of Bakersfield in the Kern River Canyon. The road is quite narrow in this area, although there are pull outs on almost every turn. Lake Isabella is a human made lake and is extremely blue on a clear day. Walker Pass is one of the lowest passes in the Sierra Nevada. At slightly over 5000 feet you barely feel like you are climbing in elevation. The pass supports a healthy community of Joshua trees. Also on the western side of Walker Pass you will see an area that supports Digger Pines and Joshua trees growing together. This is the only place in California where this occurs. The Whitney Portal Road is clearly labeled in Lone Pine. 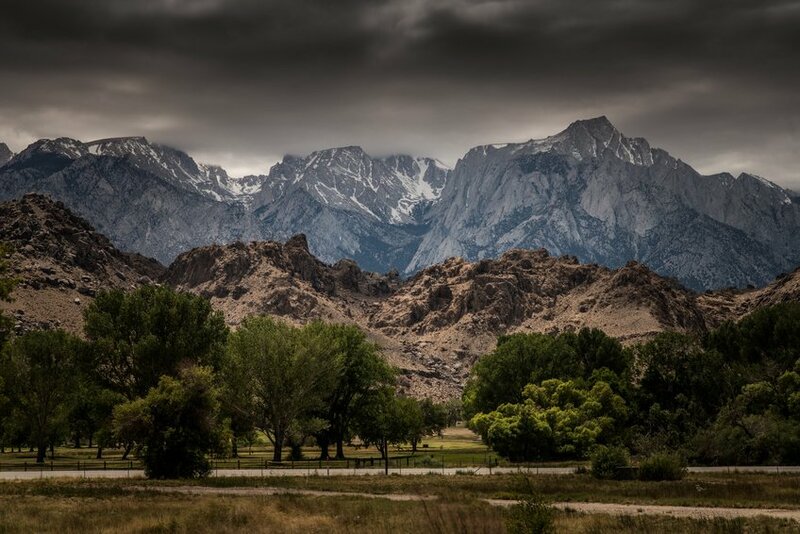 It is located on the west side of the 395 and winds its way through the Alabama Hills to the base of the tall Sierra’s where in a series of two very long switchbacks takes you into the forested slopes and to the Whitney Trailhead. It will take about 20-25 minutes from Lone Pine to the Whitney Trailhead.